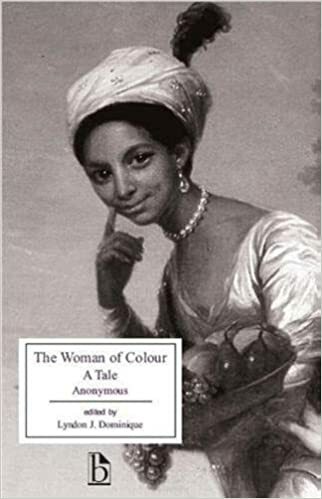 Drawing again on that list of diverse Austen-adjacent texts that tipped me off about Sofia Khan Is Not Obliged, I also decided to check out The Woman of Colour: A Tale, an anonymous epistolary novel published in 1808. It’s about the daughter of a female slave and a white Jamaican plantation owner, who is raised as the latter’s acknowledged illegitimate daughter and then travels to England to marry her paternal first cousin, a condition she must comply with in order to inherit her late father’s fortune. Interesting choice to use a detail from the Dido Belle and Elizabeth Murray portrait as cover art! This novel is exceptional, to quote the Broadview intro, “not only because it is the first long prose fiction in British literature to prominently feature a racially-conscious mulatto heroine, but also because, conceivably, a woman of color could have written it” (18). It would be really cool if that were true, and Dominique advocates for its likelihood, though unfortunately without clinching evidence. Still, there is no reason to think it not true, except perhaps for the novel’s quite stereotyped depiction of our heroine’s maid Dido, former slave of “her dear own Missee” (100). The opening pages got me pretty excited to read this book. We begin (in classic eighteenth century fashion) with our heroine Olivia Fairfield recounting the story of her birth, despite the fact that she’s supposedly addressing the letter to the governess who is her “best and earliest friend” (53). But a trip to the department of backstory is excusable when the backstory is this interesting… and, dare I say, kind of wacky. Here’s the short version: Olivia’s mother Marcia, a slave, falls in love with her master and they begin an affair—yeah, it’s presented as an affair and a mutual love story, which of course is problematic. He converts her to Christianity, at which point she points out to him that according to his values, what they’re doing is totally wrong! He feels convicted and the affair ends, but Marcia is already pregnant and Mr. Fairfield can’t bring himself to overcome his pride and risk social censure by marrying her. She then—of course—dies in childbirth. It is very, very, very clear even from these first three pages that the anonymous author has a two-pronged ideology and no intention of being subtle about either: this book is pro-Christianity and pro-racial equality. In the first quarter of the novel, these get equal treatment, as Olivia worries about what life has in store for her on the voyage to England, and then after her arrival, encounters the overt rudeness and prejudice of some family members while kindly but firmly steering others toward wokeness. The scene where Olivia teaches her fiancé’s toddler nephew that her hand is not “dirty,” and that skin color in no way indicates a person’s virtue, is probably the best moment in the novel, and certainly the most contemporary-feeling. As the book goes on, though, we go through very long section where the momentum of the plot completely stalls. (This is not a long book, but it reads like one!) Even the original boat trip grew tedious, but after a decisive move takes place in terms of Olivia’s marriage prospects (I don’t want to spoil anything, because the unexpected plot twists were what kept me reading), we encounter a deeply dull stretch where she does little but judge her Nabob neighbors for not going to church on Sunday nor taking care of their elderly relatives. In the hands of a writer like Eva Ibbotson or Georgette Heyer, the same material might have been fodder for charming hijinks; in the hands of Austen, fodder for brutal satire; but the author of The Woman of Colour is deeply in earnest. This works well only when what Olivia’s writing about has observable stakes. To be clear, a lot of pretty wild stuff does happen in the rest of the novel. It surprised me again and again. It’s just very spread out, and the epistolary format and ornate prose are a hindrance to getting invested in the story. Our protagonist has an unfortunate tendency to refer to herself in the third person. (“Ah, my dear Mrs. Milbanke! I have sometimes feared that you would never again see the hand-writing of your Olivia…”) Nearly the whole novel is framed as letters from one person, to one person, sent in large “packets” (because of the England-Jamaica distance), so the format contributes neither urgency nor a variety of voices. There is one letter from a villainous character interjected—and it’s straight out of a sensation novel, fifty years before the fact!—but it takes so long to get back to that plot point that even this can only create a vague sense of unease. I decide to teach this in my “Austen and Popular Culture” course, and I’m excited about it for two main reasons: not only does it drastically widen one’s sense of the world that Austen existed in but didn’t choose to write about, it also gives a great sense of how revolutionary Austen was as a novelist and prose writer. (At the risk of angering my eighteenth-centuryist friends and colleagues, I’m tempted to say Austen was the first person to actually get how the novel worked as a form.) The Woman of Color is a great example of the kind of sentimental fiction Austen lampoons in her juvenilia with texts like “Love and Freindship.” As a full-length prose work about a mixed-race woman that deals head-on with racial prejudice, it’s also a great source of insight into the politics of race, class, and hybridity in this era in England. And you know what? There’s something to be said for existing before novel norms have gelled. In between a lot of sermonizing and flowery diction, this book packs a few wonderfully unconventional punches. But no spoilers here. As Dominique mentions in the introduction, The Woman of Colour was recognized widely enough on publication to receive three—albeit lukewarm—reviews in contemporary journals (19); this isn’t some hand-scrawled manuscript forgotten in an attic trunk that’s only just seeing print. Why the book was forgotten is a tricky question, and one the introduction can only speculate on. (Why does any text get forgotten?) From an artistic or entertainment standpoint, “lukewarm reviews” and a brief shelf life seems about right. From a historical significance and novelty standpoint, it’s pretty remarkable and well deserves to be remembered. Annoyingly, the text isn’t available on Project Gutenberg or any other public domain venues I came across—not that I begrudge Broadview, who produced a thorough edition with an intriguing selection of supporting contemporary sources. I’d love to have the searchable text, though. Of course my governess sensors were going wild, but the addressee of the letters never becomes an on-page character. Who knew people were named Marcia before 1940! Though at only 140 pages, it should perhaps be called a novella.